The Bench Player: Discover 5 Key Roles for the Athlete Who "Rides the Pine"
Playing the role of bench player is a tough gig. It's not easy being an athlete who "rides the pine." Sitting at the end of the bench. Heart pounding. Eyes looking down at the floor. Trying desperately to make myself invisible. I didn't want to go in. Our team had a sizeable lead, and I knew Coach was scanning the bench. It was my freshman year in high school. I played on the freshman team, but that night I was given the chance to suit up with the varsity. Our team was dominating the game, and it was time for coach to give playing time to those on the bench. With my lack of experience at that level, I was terrified. I continued to join the varsity that season and continued to ride the pine. But the more experience I got playing with them, the hungrier I was to get off the bench. The bench player is no doubt the toughest and typically the most unfavorable basketball position. Players who find themselves on the sideline game in and game out can get pretty discouraged. Unfortunately, there are more players on a basketball team than there are positions on the floor. Only 5 players can play at a time, so with 10-12 players on the roster (and many more than that on most middle school teams), that leaves more than half the team on the bench. 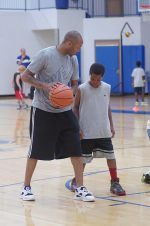 Youth basketball rules often mandate that every player plays at least half the game. But as players mature and the level of competition increases, those rules change. There are no guarantees for playing time. Let's be honest. Sitting on the sideline isn't fun. We don't try out for the team because we want to be a spectator. No, we want to play. So, what do we do? Few players can give 100% effort for an entire basketball game. Most players need breaks from time to time, and coaches need good substitutes at every basketball position to replace them. The best teams in any league are those that have a strong bench. They have the depth that allows them to substitute solid players without losing any ground when the starters come off the floor. They have bench players who are prepared and ready to go. 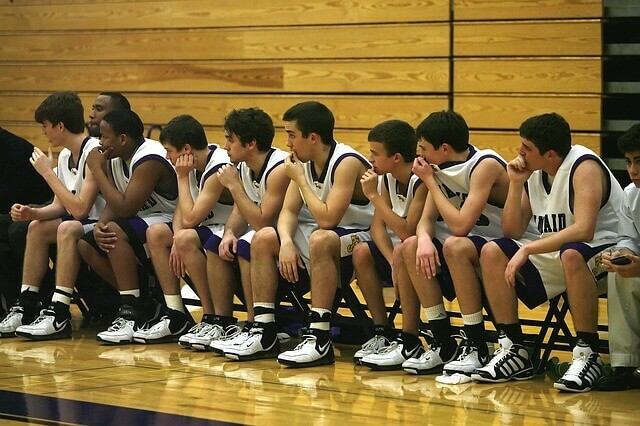 If you find yourself spending a lot of time on the bench during basketball games, don't be discouraged. Like every other position on the floor, you have responsibilities that only you can fill. You may not have chosen your role on the sideline, but as a member of a team you owe it to your teammates to do your job. If you find yourself sitting during your basketball games, here are some important action items you can do that will not only make your team better, but just might earn you a little more playing time in the process. I know. That isn't easy. After all, you put in the same number of hours on the practice floor as the starters but don't get the same playing time. But until you get your attitude in check, you're not ready to move on. Your #1 job as a bench player is to work your tail off during practice, pushing the starters to be as prepared as they can be for the games. Make them work hard every day. Play scrappy defense. Pressure them to handle the ball. Push them to use their weak hand. Deny the passing lanes and force them to make good passes. Sprint down the floor to make them transition quickly. Hustle after every loose ball. Play as hard against them as your opponents will. Working hard to make your teammates better is one of the best contributions you can make to your team. Plus, it will make you better. I guarantee your coaches will notice. You've got to be prepared to enter the game at any moment. You never know when you'll be called to step onto the court. When that time comes, you better be ready! It's easy to get distracted. You get bored. You chat with buddies. Before you know it, you have no idea what's happening. And then coach calls your name. And you don't have a clue. I guarantee you Coach will think twice before calling on you again! Stay focused and engaged in the game. You need to know what offense and defense the team is running, who you'll substitute for, who you'll guard, what basketball position you'll play, etc. No one expects you to be thrilled by having to sit on the bench, but you do have a responsibility to have a positive attitude, encourage your teammates, and build team unity while you're there. It's not the time or place for complaining or negative talk. It's so important to players on the floor to see and hear their teammates on the bench pulling for them and cheering them on. Remember, this is a team game. When you get your chance out on the floor you'll want your teammates cheering for you as well. One advantage of being a bench player is that you're able to get a feel for the game before you're thrown in the middle of it. Unlike starters who have to battle pre-game jitters and get in the flow of the game, you have a chance to watch and take mental notes. What does your team need? What is the team missing that you can bring? Chasing down rebounds? Hitting open shots? Making the good pass? Hustle? I've seen many players come off the bench and inject a much-needed burst of energy that turned the game around! Sometimes, Coach will call you off the bench to enter the game in a pressure situation. Maybe it's a close ball game, and you have to replace a teammate who's injured or in foul trouble. You're thrown into a situation where every shot you put up, every pass you make, every defensive stop you get is crucial. As a bench player, you may not get to play a lot of minutes, but the few minutes you do play are really important ones! Every single player on the roster has an important role that only she can fill. Every basketball position is important. When everyone takes care of their individual jobs, contributing their part to the unit as a whole, you create a team that's tough to beat. Don't ever underestimate your value as a bench player. Do your best to fulfill your responsibilities while you're there, and if you don't like your role on the sideline, do something about it. Make yourself better by working hard to improve your individual skills. Don't be on of those players who gets discouraged at their lack of playing time and quits working to get better. They give up. Your best chance to get off the bench is to improve every area of your game. Don't let anyone outwork you!